Kettal Mesh collection recalls architectural facades, which filter the surrounding environment without stopping the light and air flow. Industrial and natural materials, hard and soft surfaces, transparent and solid volumes are putted face to face in order to create this family of outdoor furniture based in contrasts. 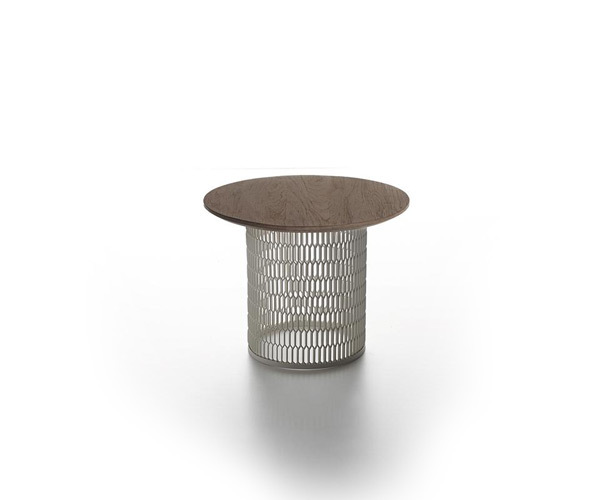 The expanded metal used for backrest of the sofas and tables gives a feeling of lightness, and at the same time become the support for wooden and marble tops and cushions. The slight bending of the sofa arms give a delicacy to this industrial frame, inviting the user for a nap. The solid wooden base of the sofa and the voluminous and comfortable upholstery resembles the memory of a comfortable living room translated into an outdoor atmosphere.